Volvo Penta has expanded its commercial marine engine lineup to offer a new diesel 8-liter engine, engineered with the latest technology for applications that require low weight and high power. The D8 engine is designed to offer high-performance power to fast patrols, coast guard and rescue launches, police and ambulance boats, water-taxis and high-speed passenger ferries, fishing boats, and off-shore support vessels. High power and torque rise – for speed and excellent load-carrying capabilities. High low-end torque and wide rpm range – for excellent maneuverability and acceleration. Reliable – for maximum uptime. Low fuel consumption – for low cost of operation. Low noise levels – for good on-board comfort for crew and passengers. The D8 was developed with three power outputs for the inboard range –450, 510 and 550 hp – and is engineered to meet US EPA Tier 3 and IMO II standards. 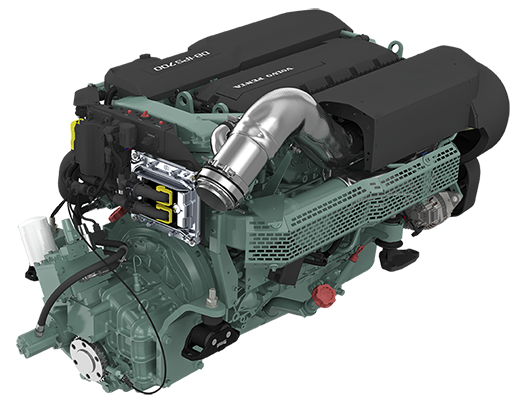 The new marine engine is based on the Volvo Group’s D8 on-highway and industrial engine platform, which has had success with trucks, busses and other applications. The marine D8 was developed at the state-of-the-art Volvo Penta marine test center in Gothenburg, Sweden, where extensive testing on a variety of more than three dozen vessels. Field tests have shown that the engine is exceptionally reliable, an important aspect for commercial operators. The engine will be ready for delivery in June 2017. Read more about the new engine on MarineLink.